Barcelona Trophy Betting Specials - Can they win the treble at 9/2? Barcelona Trophy Betting Specials – Can the Catalans win the treble at 9/2? It’s shaping up to be a very good season for Barcelona. Having already won the Spanish Super Cup, they could end the season with four trophies if they can keep producing the goods over the next couple of months. Ernesto Valverde’s men are now certainly firm favourites to end the season with every piece of major domestic silverware in Spain. However, it’s the potential for Champions League glory which has got Barcelona fans dreaming of a clean sweep this term. With both Madrid clubs already out, Barcelona are now the only sided capable of salvaging another European clean sweep for Spanish clubs. They will probably have to overcome a series of Premier League tests if they are to manage that but with Leo Messi continuing to perform at an extraordinarily high level, they will fancy their chances of going all the way and winning the treble, something which they can be backed to do at 9/2. Leo Messi has scored two sublime hat-tricks in the city of Seville since the turn of the year. The second was capped by a incredible chipped finish as Barcelona won 4-1 at Real Betis on Sunday evening. It was greeted by a standing ovation from the Betis fans, some of the most passionate and hostile in Spain. Messi has now scored 18 goals in 2019 alone and we are less than three months in. He shows no sign of slowing down at the age of 31 and is the principal reason why Barcelona are now ten points clear at the top of La Liga. Atletico Madrid’s defeat at Athletic Bilbao over the weekend ensured that lead grew and if there was any doubt about the destiny of the title race, it has now effectively been removed. There are just ten games to go and it’s virtually impossible to see either Madrid club catching Barcelona. Even if Atleti win at Camp Nou when the sides meet in early April, Barca would still need to suffer a further three slip-ups in their other matches to even open the door to the sides from the capital. Having dropped just 4 points over the past 15 league games, it’s almost impossible to see that happening. Therefore the first leg of a famous treble now looks in the bag and it’s a question of if and not when Barcelona are crowned Spanish champions. It will be an 8th league title in 10 years for the Catalans, an almost unprecedented era of league dominance in Spain. If Barcelona beat Valencia in the final, they will become first team in history to win five successive Copa del Rey titles. Barcelona are currently 1/5 to complete a domestic double with bet365. Those odds look a little bit short, not because the league title is in any doubt but because they will face a tough test in the Final of the Copa del Rey against a revitalised Valencia. Los Che are currently on a 15 match unbeaten run in all competitions and could be a tough nut to crack in the Final in Seville. They’ve a sense that their name may be on the trophy in their centenary year, especially having come from two goals down to progress in both the Quarter-Finals and Semi-Finals. They scored twice in Stoppage Time to seal a dramatic win over Getafe in the 2nd Leg at the last eight stage and Valencia have also posed problems for Barcelona this season. They put in an excellent counter-attacking display to draw 2-2 at Camp Nou in La Liga last month and will fancy they can give Barcelona a good game in the Final. The Catalans are clearly the superior team overall and having won the competition in each of the past four years will still expect to taste victory but at 1/5, it’s probably not worth the risk. Can Barca go all the way in Europe? If you fancy Barcelona to end the season strong, there is more value to be found in backing them to go all the way and win the treble at 9/2, something they managed in both Luis Enrique and Pep Guardiola’s first seasons at the club. The path to European glory is full of difficulties. They will have to come through a Quarter-Final against a resurgent Manchester United before most likely facing Liverpool in the last four. Plotting further ahead, it’s most likely to be Juventus or Manchester City in the Final so Barca are going to have to beat some very good sides to get their hands on the Champions League. They do have at least a couple of significant advantages on the English sides that lie in wait though. The first is that Barcelona have effectively won their league already and will be able to rest players from now until the end of the season. Certainly their league matches around the time of their remaining Champions League ties will almost certainly see Ernesto Valverde rest a host of key players. The Premier League teams meanwhile have no such luxury with both the title race and battle for the top four set to go the wire. That could be a very significant advantage for a Barcelona side that has tended to run out of steam at the business end of recent seasons with fatigue a factor in their most recent Champions League exits. We recently analysed the damage, competing on multiple fronts can do to a team’s chances of silverware. In terms of how they function as a side, you could make a case for saying Manchester City and Liverpool are both currently superior to Barcelona. However the Catalans have a considerable ace up their sleeve in the form of Leo Messi. 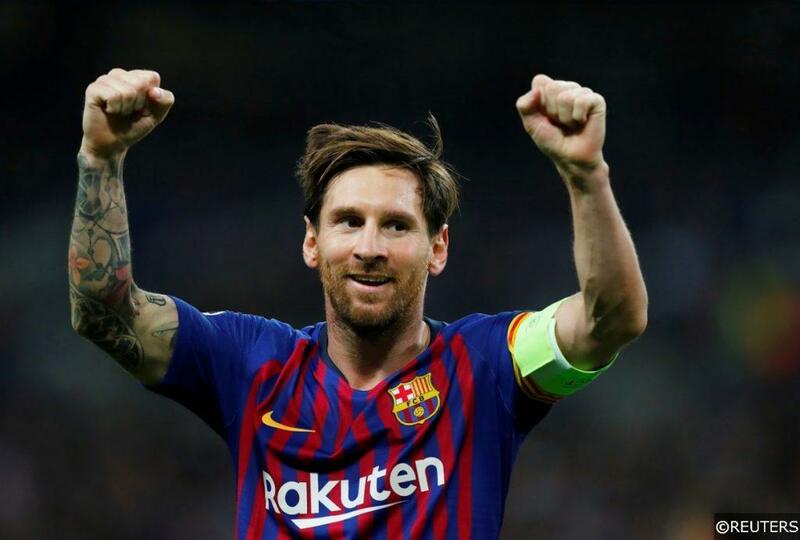 It’s not fair to call them a one-man team but Messi is good enough to decide a tie on his own and he largely did that as Barcelona beat Lyon 5-1 last week with the Argentine scoring two and creating two. He is currently playing some exceptional football, even by his own ridiculous standards. Barca will now be able to rest Messi in La Liga and save him for the big European nights and that is very bad news for the rest of the competition. With Messi in this kind of form, backing Barcelona to win the treble at 9/2 could be worth a flutter. Categories: Betting Odds, Blog, and Football. Tags: ernesto valverde and leo messi. Team Tag: Barcelona. League: Spanish La Liga and UEFA Champions League. Sports: Football.